Symi excels in general appearance! 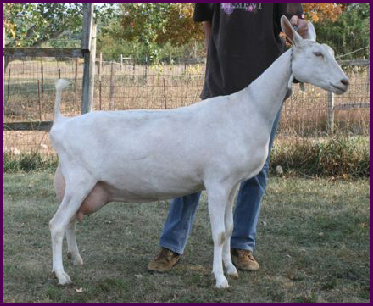 She's long and level with beautiful rear leg set, strong in topline with a wide rump and great width between the thurls. I enjoy watching this doe on the move. Her mammary is excellent with her 36 fore, 42 rear height and 37 arch! 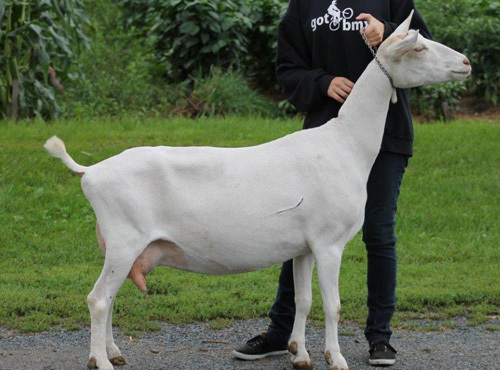 Symi has done a good amount of growing this year and is an eye-catching doe with an exceptionally level topline. Copyright � 2016, Poplar Hill Dairy Goat Farm. All Rights Reserved.